Our captain delivered a Man of the Match performance in the win over Chelsea and got himself an assist by digging out a cross to put the opener on a plate for Sadio Mané. When the game was poised at 0-0 at half-time, Jordan Henderson has revealed what Jürgen Klopp said in the break to inspire two sublime goals in quick succession that got us the three points in style. 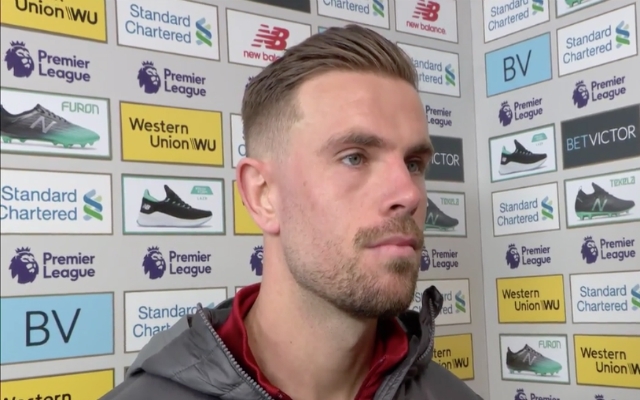 Post-match, alongside Virgil van Dijk, Hendo was asked what Klopp had told them at half-time and he jokingly told Sky Sports: “Can’t tell you that”. He then admitted that the German told them to, “Keep going, keep doing the right things, couple of things we needed to work on, we need to create better spaces for each other. It proves that the manager doesn’t need to bark orders or get frustrated. All the players need is a reminder to keep at it, to keep pushing on and helping each other out to get the result. It was a simple but effective message from Klopp that clearly worked wonders. After the interval, goals in the first ten minutes of the second half sent Anfield into euphoric elation as we flew into a 2-0 lead after Mo Salah’s wondergoal and went back to the summit of the table. “I thought there was a period where we sort of blew them away a little bit,” Hendo suggested. Klopp’s men can only focus on themselves and keep putting the hard work in while us fans keep the faith and try and enjoy this white-knuckle, heart in mouth title challenge. We’ve got four games to go and an “easier” run-in on the face of it as Manchester City have to face up against Manchester United and Tottenham Hotspur before the end of the season. All we can do, as Hendo says, is focus on the next game and go out to win every single one of them.